The world premier screening of animated film AJIN: DEMI‐HUMAN-Compel was held on October 28 at Tokyo’s TOHO CINEMAS Roppongi Hills as part of the 28th Tokyo International Film Festival’s Panorama section. 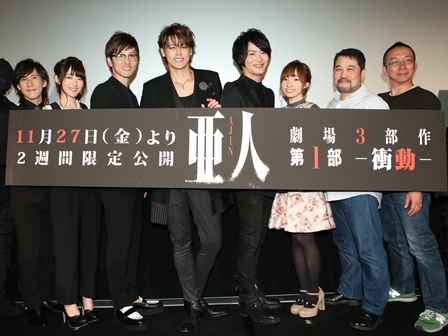 Supervising director Hiroyuki Seshita and director Hiroaki Ando appeared to present the film together with main character Kei Nagai’s voice actor Mamoru Miyano, Yoshimasa Hosoya (who plays Kaito), Takahiro Sakurai (playing Yu Tosaki), Daisuke Hirakawa (Koji Tanaka), Mikako Komatsu (Izumi Shimomura) and Aya Suzaki (Eriko Nagai). The film is based on Gamon Sakurai’s original comic with the same name, which is currently being serialized in “good! Afternoon” (KODANSHA Ltd). It depicts the struggle of high school student Kei Nagai who is killed in a traffic accident. He wakes up to find that he is an undying new form of human called Ajin which are being hunted by the Japanese government. There will be a total of three installments of animated films, beginning with DEMI‐HUMAN-Compel which will be screened for only two weeks beginning November 27. A TV anime series is also in the works and to be aired on TBS, MBS and other stations beginning January 15, 2016.